See below for the current listings of Active Adult sales in Howard County or use the above Tab “Interactive Map Search” to do your own search. The style of homes could be single family, a condo located in a building with other condos or a town home situated adjacently to other town homes. The overall style and arrangement of 55+ Active Adult Senior Living Communities varies greatly from community to community and offers many choices from which to select. Most require that at least one of the occupants be fifty-five and they will require proof. Some communities may permit adults under fifty-five to move in but it’s community specific. One requirement they all have is that no one under the age of 21 can live in the unit for more than 30 days. This has been a sticking point for a few communities as living situations of families change. Please Note….this search below may not afford you with all possible options as some don’t make it into the specific search capture. I would welcome the opportunity to do a detailed search for you. Just give me your wish list and I’ll get to work. A diamond in the rough awaits in the heart of Gwynedd Valley. Sited on 1.46 acres, this is not your traditional cape style home as the 2-story addition offers a spacious eat-in-kitchen, breakfast room and family room on the first floor, and a master suite with master bath and two walk-in closets on the second floor. The main level of this home also offers two large living rooms - each with wood burning fireplaces and a spacious formal dining room. Three additional bedrooms, hall bath, laundry area and loft-style office completed the second floor. The pool house is equipped with a full kitchen and bath as well as greenhouse. An in-ground pool and tennis court are framed by mature landscaping. This home is in need of some TLC but the possibilities are endless. Fabulous location in Lower Gwynedd - within walking distance of the Gwynedd Valley train station and minutes from the new Spring House Village shopping center and major routes. The property is also available as a building lot. Why rent when you can own this impeccably maintained townhome in Village At Sherando! Well maintained with many updates. Newer roof, granite counter tops in kitchen and baths, Bathfitters tub for easy maintenance, and beautiful deck. This 2 bedroom, 1.5 bath home has been well maintained and is 100% move in ready. The lovely yard is full of mature planting~s and the huge deck is perfect for sipping a cold glass of sweet tea in the summer afternoons that are coming. Close to shopping, walking trails, and basketball courts. This one will not last, so call or text today to have your private showing. This home will qualify for all types of financing. Charming Larchmont home overlooking Gwynn Oak Park. Complete rehab inside and out by licensed contractor. 3 bd, 2 bath with 1 car garage/long concrete driveway + off street parking. Featuring new roof, HVAC, electrical, plumbing, brand new sump pump system, siding, water heater, concrete patio/landscaping, 24 hr water resistant flooring, updated baths and open concept kitchen w/ brand new SS appliances, granite counters + bar area. Crown moulding/chair railing through out living/dining and kitchen. Lower level bedroom with full bath/walk-in closet, egress window and garage access. Great price! Take a look!!! This Garnet Valley Farmhouse is ready for it's new owner! This is a nice, sizeable and affordable home in move in condition. The large, eat in kitchen has granite counters and was new in 2017. There is a formal dining room and large living room with new carpet and fresh paint! First floor master bedroom with a renovated master bath and laundry. There is a bright sunroom/4th bedroom as well. The steps have been recently rebuilt and are no longer steep and scary! Upstairs has 2 Big Bedrooms with new carpet and a renovated full bath. There is also a walk up attic for plenty of storage. This home is part of the Longmeadow Development and has a large flat lot, gazebo and plenty of off street parking. This home is close to schools, DE tax free shopping, and major roads to Wilmington, Philadelphia and King of Prussia! This is a fabulous buy for Garnet Valley! Detached Home at a Townhouse Price in the Hereford Zone. Surround yourself with Peace and Tranquility! !This unique contemporary home sits back off Middletown Rd. on 1.17acres. You'll love sitting out on one of the decks enjoying privacy and nature all around. Inside you'll be greeted with charm and character. Open floor plan boasts cathedral ceilings with windows and skylights that drench the room with tons of natural light. The main living area centers around the brick fireplace with mantel. This home was meant for entertaining- with a deck that extends the entire front with a separate deck off the back. 2 spacious bedrooms upstairs share a full bath with natural light from skylight. Bonus room in the loft area makes for a great office! Basement offers laundry plus lots of storage. Just a few minutes from 83 make this a perfect location to points south or north! Close to NCR Trail and Prettyboy Reservoir! Once you enter this classic, brick Colonial home located on a tree lined street in the desirable East side of Haddon Heights, you will without a doubt feel at home. 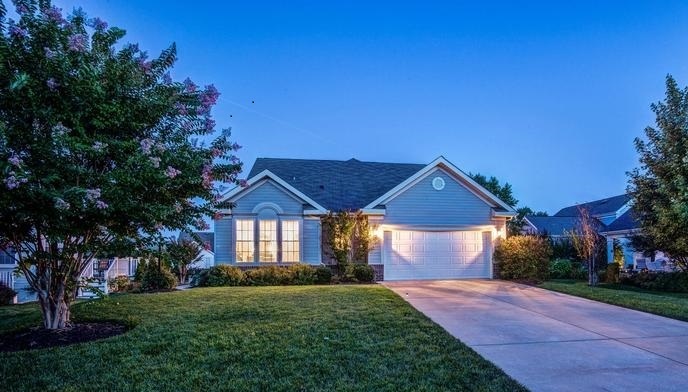 This meticulously maintained home offers 4 bedrooms, 2 full and 2 half baths. Upon entering this gorgeous brick, low maintenance home, you're greeted with hardwood floors in the living room and dining room. Towards the back of the house is an addition with a large family room, eat in kitchen, island with granite counter tops, custom cabinets and stainless steel appliances. You will immediately appreciate the wonderful entertaining flow this area offers with a fire place and large deck just outside. Topping off the 1st floor is a mud room with a side door entrance, the Bar/ butler's pantry with a granite counter top, and a half bath. Upstairs is a large master bedroom suite with vaulted ceilings, large closets, and a master bathroom with a walk in shower and Jacuzzi tub. There are three more generous sized bedrooms and another full bath. To complete this home there is a finished full basement with a game/entertainment room, which has a half bath and laundry room. Don't forget the sprinkler system, alarm system and garage. This house is conveniently located near major highways and minutes to Philadelphia and the PATCO Speedline. It is close to local public and parochial schools, restaurants, and a beautiful downtown shopping area and parks. Come see this beautiful home and make it your own! The sophisticated elegance and unique features of this gorgeous home are certain to captivate you. The moment you enter the two-story foyer with checkerboard marble flooring, you are greeted with an abundance of natural light and a gorgeous view of a grand staircase and formal dining room. Whether you create your own masterpieces or simply like to collect fine art, you have your own private art gallery ready to display and share your collection. This house is expansive and has plenty of space for entertaining including an eat-in kitchen with granite countertops, two-story family room, and 16x16 four-season sunroom. Telecommute from your large home office with windows that offer brightness and French doors to maintain privacy. This master suite feels like resort with cathedral ceilings, an oversized sitting area, jacuzzi tub, river-rock shower, and two walk in closets. There are an infinite number of upgrades in this home including Palladian windows, nine foot ceilings on every level, multi-dimensional crown moulding, 16x16 four season sunroom, hardwood floors throughout, recessed lighting, surround sound, gas fireplace, seven chandeliers, full unfinished basement and so much more. Stunning classic all-brick RANCH home, located in highly desirable, Starview Heights. Featuring 1,744 SF of Living Space + BONUS: Partially finished Basement Space! This 3 Bedroom, 2 Bath home is everything you could have hoped for and MORE! Formal Living Room and Dining Room are bright and cheerful with new laminate flooring. Spacious Eat-In Kitchen features NEW gas stove and microwave, a built-in Breakfast Bar, gorgeous cabinetry and an abundance of space! First Floor Washer & Dryer (both included). The Family Room is an entertainer's dream with a Brick Gas Fireplace with sliders leading out to the newly finished Deck! Oversized 2 Car Garage with walk-up stairs leading to your very usable Attic Space. Sitting on .33 acres of level land, this property boasts a beautifully landscaped yard, a shed, concrete driveway in a lovelyneighborhood! Fresh paint throughout, new flooring, updated Bathroom, newer Roof, newer heating/cooling system. In close proximity to Heritage Hills Golf Resort, local playground and so much more! Enjoy luxury, low maintenance living in the highly desirable and amenity rich South River Colony! This brick-front, freshly painted, 3-level, 2-car garage townhome, located in The Pointe community, offers a BRAND NEW roof with architectural shingles, new carpet, new dishwasher and new luxury vinyl tile flooring in the family room. With 2,500 + SF of light-filled, open space, highlights of this home include: 9' ceilings; gleaming hardwood floors on the main level; custom plantation shutters; large kitchen with center island, eating area and gas fireplace; a master bedroom suite with a tray ceiling; a large master bathroom with soaking tub, separate shower and dual sink vanity; and a lower level family room with 2nd fireplace. You'll enjoy the outdoors in the private, fenced rear yard with a paver patio and deck. Located across the street from South River HS and minutes away from Annapolis, the community amenities are numerous. There are 2 swimming pools, tennis & basketball courts, walking paths, and tot lots. Adjoining the community, The Golf Club at South River offers golf and social memberships. Live where you play! One-year home warranty included!! Come experience the panoramic golf course views of the beautiful Prospect Bay home. With over 3000 square feet of living space this home has it all ~ 9 ft. ceilings, crown molding, hardwood floors, gas fire place, central vacuum system and the list goes on. You~ll the love the gourmet kitchen with granite countertops, large center island, stainless steel GE profile convection oven, and six burner Dacor stainless steel gas cooktop. The first-floor master suite has a super bath with Ultra Massage tub, custom tile and duel head shower. The home office is wired for performance. The sunroom has cathedral ceilings and is surround by Anderson windows accentuating that stunning golf course view. You~re just a short walk to the community beach and marina. Community amenities also includes golf, pool, tennis, boat ramp, club house & restaurant. Have you ever dreamed of living in a beautiful and completely renovated 4 bedroom 2.5 bath turn of the century Victorian home? This home is equipped with the old world style and versatility demanded by today's homebuyers!! The benefits of owning this home are numerous; including a large fenced in yard, 1.5 car garage and in law quarters in basement that add to the homes functionality and style. Are you endlessly searching for an affordable in law en-suite quarters for extended family living? This home~s got a spacious basement living quarters complete with full kitchen and full bath. yet somehow the owners have still remained true to the home's original character and Victorian charm. the first floor has an architect inspired open floor plan that makes the most of the available space with features like 9~ ceilings w crown molding, In this home~s kitchen you can create a warm and inviting space to entertain your guests, with features like; 22 handle raised panel solid cherry cabinets, Stainless steel appliances and fixtures, contemporary tile backsplash and a ceramic tile floor. This property is exactly what you have been waiting for. This is your opportunity knocking, hear it?. Imagine each day arriving home to your newly appointed stately Victorian home that is equally functional for your entertaining or extended family living arrangements. From the moment you walk through the front door, you are greeted by the well lit floor plan which offers a classic Victorian style architect inspired open floor plan. Upstairs you~ll find the second floor you~ll find 3 bedrooms with fresh paint and carpet and one fully renovated oversized bath complete with new fixtures, vanity and ceramic tile floor. The feeling you~ll get with this one is buy, Buy, BUY~your new home before someone else does! The owner has decided to make this pre-owned purchase even better, we are offering an unlimited bumper to bumper HSA 7-Star Home Warranty so You drift to sleep tonight, worry free, knowing everything is covered, down to the last doorknob. This FANTASTIC home will knock your socks off!! Close to downtown Pottstown, shopping, Schuylkill River Trail, great local restaurants or hop in your car for a 12 minute drive to Limerick Premium Outlets. THIS IS AS GOOD AS IT GETS in pure old world Victorian style, modern creature comfort and location, Location, LOCATION convenience. Simply put, this is an amazing opportunity to own a home that has an in law quarters, open floorplan, new gas heater, great location, low taxes, and the beauty of moving in and having to do nothing but bring your furnishings! DON'T MISS viewing this SPECTACULAR HOME! This lovely home as been polished into shape and is ready to move into tomorrow! Consider that it is freshly painted, has new flooring throughout the home, the deck has been refurbished, the gas fireplace serviced and the bathrooms have been freshened and one of them rebuilt. Located in the very cute Stoney Run Community, this particular homes backs to the elementary school and township park and ball fields. You get to enjoy all of that open space and someone else will cut the grass for you! There are also Cathedral Ceilings, multiple ceiling fans and recessed lighting. It has been priced right and is ready to go to settlement. Wonderful, new, corner lot home in an established neighborhood. Stellar appointments in virtually every room. Stunning hard wood, Molded cabinets in the kitchen. Granite countertops. Stainless steel appliances. Fireplace. Furnace humidifier. 2 master suites. Elegant master bath. Office. Fenced in back yard with a sizable porch in the rear for grilling and entertaining. Efficient Nest temperature control unit conveys. Fully renovated 4Bed/3Bath home on a double lot with off street parking & a large covered carport. The property features a spacious & open owners suite with dual closest & attached luxury owners bath with custom tiled shower surround w/glass enclosure. The home also offers new hardwood floors, new furnace/AC, new deck & enclosed sunroom, new kitchen with granite/SS appliances/solid wood cabinets/tiled backsplash, recessed lighting, new fixtures throughout and a large fully finished lower level! Location, location. Minutes to schools, shopping and hospital. Spacious brick front colonial on 2.82 acres. 4 bedrooms 3 full and 1 1/2 bath. Large kitchen with granite counter tops. Nice eating area with sliding doors that lead to fabulous deck to enjoy summer dining. Large family room with gas fireplace. Formal living and dining rooms great for entertaining. Office with beautiful views out the front windows. Generous master suite with full bath and 2 walk in closets. 3 additional bedrooms upstairs. Finished basement has great room with gas fireplace. There is also a second office with another full bath. 2 storage rooms, one of them would be a great workshop. Main floor laundry with utility sink. Side load garage with plenty of parking and circular driveway. Seller to have fence painted and driveway sealed. Very rarely do houses go up for sale in this quiet Northeast Community of Oxford Circle. This 3 Br, 2.5 BA property that hosts a bonus room in the basement is a must see. If you love wood floors, then this is the house for you. By the kitchen there is a door that leads out to the side of the house which leads to the one car parking located in the back of the house. The dining room is right off the kitchen that connects to the spacious living room. There is lots of space for a growing family. This outstanding split level has been totally remodeled from top to bottom. Many new upgrades within the last year, including a new roof, brand new powder room and totally remodeled full bath, new double driveway, and new air conditioning system. Highly efficient gas hot water heating system and hot water heater were installed in 2012 and electrical service was upgraded in 2011. Cherry hardwood flooring throughout the living/dining rooms, kitchen, two bedrooms, steps and hallway;laminate flooring in family room and second bedroom. Remodeled kitchen features 42 cabinetry, granite counters, stainless steel appliances and oversized stainless sink. Brand new sliding glass door off dining room leads to paver stone patio and large vinyl fenced in yard. The family room is perfect for entertaining with lots of recessed lighting, electric fireplace insert with remote control, and access to new powder room, laundry area and separate storage/utility room. The main bathroom has been completely remodeled with double vanity sink with self closing drawers, new tub and ceramic-tiled surround,ceramic flooring, two storage closets and shiplap wall planks. Excellent location in highly rated school system and within walking distance to elementary school. Coming to the market next week. 4 Bedrooms 2 and 1/2 baths in Red Lion Schools. Move In Ready!!! LIKE NEW...Built in 2013. Cherry HARDWOOD FLOORS, Ceramic Tile baths, Chef's Kitchen features Java/Dark Wood Cabinetry, EAT-IN Kitchen has an Island with built in Sink, Corian Counter tops, GAS STOVE, Main Level Open floor plan features 9' ceilings, Extra Long Windows almost to the floor and a GAS Fireplace. The 2nd floor has been recently updated with pergo faux wood flooring, Master BR includes Full bath and WIC, Convenient 2nd Floor laundry & 4th BR is extra large over the garage Lower Level is a walk out with FULL size Windows and a 6' Slider to the backyard that is great for Sledding. Backs to trees for privacy. Garage has plenty of storage shelves. This home is located in a rural USDA eligible area so you can purchase with 100% Financing.Looking to move right in to a quiet area that is minutes to shopping parks and eateries THIS IS YOUR HOME!!! Welcome to the wonderful Hills of Breckenridge! This neighborhood is in such a great location. Close to shopping and close to I-95. Enjoy summer evenings on your large front porch. Brick front, 2 car garage and tasteful landscaping. Walk into spacious foyer with space for an office. Two story family room with Fireplace. Main level has a wonderful bedroom and a full bath. Gourmet Kitchen with Granite, Cooktop, Wall Oven and Pantry opens to informal dining or sitting room with lots of windows for natural light. Rear Deck looks onto woods. Master Bedroom is a must see. Large space with Cathedral Ceiling, sitting room with Fireplace,spacious master bath with jetted soaking tub, tiled stand up shower. Lots of cabinet space with a vanity....this is a true oasis. You will fall in love! Gorgeous two-level condo just minute from One Loudon! Ryan Homes' Matisse floor plan. The main level features an open floor plan, plentiful natural light, hardwood floors, a gourmet kitchen with granite countertops, premium cabinets, stainless appliances and more! The upper level features an en suite master with walk in closet and two additional spacious bedrooms. Balcony and garage parking in rear. Amazing location in the heart of Ashburn, nearby lots of shops and restaurants. Less than one mile from new Silver Line Metro stop. Welcome home to this large 4 bedroom, 2.5bath all hardwood and tile floor home nestled in a quiet setting on a dead end street. Freshly painted! Enjoy the new rear paver patio or relax on your deck. This split foyer could be expanded to 5 bedroom and a large rec room if you finish the remaining half of the bottom floor. The bottom floor 1/2 bath has a rough in (under tile) for either a shower or tub, expanding the home to 3 full baths if you want to make the upgrade once you own! Extremely quiet neighborhood back in Pinedale Wood/Courts yet close to Perry Hall and Whitemarsh amenities. Move-in ready! Includes a shed and firepit with view of pond on adjoining neighborhood. HVAC replaced in 2014, hot water heater replaced in 2013. AHS Home Protection Plan included with the sale of the home for the first year. Gorgeous setting surrounds this well maintained 3 Br, 2 Bath ranch home. House located at the end of cul-de-sac on .47 acre lot. Features master suited living room with vaulted ceiling, separate dining room, extra counter and cabinet space in kitchen, mud room, 2 car carport, front porch, and fenced yard with gazebo. The beautiful upgrades to this home on one level living. New laminate wood flooring throughout and brand new slate appliances. Private and quiet community, mature landscaping on almost half acre. Lots of storage space! Minutes to Tax Free shopping! Many places to dine. Within walking distance to Rita's Water Ice! This is a bit of a fixer upper, priced as such. This home is being sold in it's present As is condition. No FHA or Va financing, strictly Cash or Conventional financing. Nice size row airlite with 3 bedrooms, 3 piece bath, full basement, rear 1 car garage, laundry room, and rear driveway. Original Family owned porch front brick Palladi Townhouse with Terracotta tile roof,open wall kitchen with ceramic tile flooring updated appliances, hvac,gas water heater, beautiful hardwood floors, updated six panel doors,knotty pine family room, new concrete driveway and sidewalks, attic steps, dual pane windows and fresh paint. This home has always been well cared. What a gorgeous place to call home! Recently remodeled, 21305 Lentz Road sits on 4.31 acres backing to farmland. The entire kitchen was renovated in 2017 and offers granite countertops, ceramic tile backsplash, replaced stainless appliances and center island. Gleaming hardwood floors throughout most of the main level, replaced carpeting and fresh paint. Spend time reading in the spacious sunroom or cozied up by the woodburning fireplace in the updated lower level. Other features include: rear fencing and shed - 2018, new shutters - 2019, new interior doors and many replaced windows. Not to be missed! Buyer to verify with county, but possibility of recording and building on adjoining lot. Welcome Home! Your search stops here! Welcome home to this move in ready and rarely available Perry Hall town home that lives larger than you would expect for a price you can afford. Enjoy an open floor plan to your living and dining room combination; spacious enough for holiday entertaining but cozy enough for daily living. An eat in kitchen with pantry, young appliances and sliders to a spacious covered deck with views of shared open space and gorgeous sunsets. The upper level offers a large owners' suite with an abundance of closet space, and an updated master bath. Two additional bedrooms all with new carpet, an updated hall bath, fresh paint, and loads of attic storage complete the upper level. The lower level includes your 4th bedroom or office space, (your choice) an extra large family room with potential wetbar, half bath and sliders that walk out to a charming back yard. Newly updated electric panel, new replacement windows, young HVAC (2016) round out this top pick. Don't let this one pass you by! Newly Renovated Home Throughout with Lots of Land! Must See! Ranch-Bungalow Style home in North Penn School District. This beautifully renovated home consists of 3 bedrooms with 2 full baths, newly updated kitchen, and a detached over-sized 2+ car garage with plenty of room for a workshop. The inside of the home has laminate flooring, new drywall, freshly painted throughout and much more. The property consists of two parcels making it a total acreage of 1.5 +/-acres. Enjoy your coffee on the private front porch that overlooks open ground surrounding the home. The back yard is large enough for a fire pit with additional structures so bring your imagination. There are several mature trees and flowers throughout the property. Close to major routes, shopping, restaurants, and public transportation. Schedule your appointment today. Quick settlement available. GARAGE**Ideal workshop (can not house car). Very special end of group home loaded with windows and flooded with light. The generous ceiling heights have a great impact on the space. Formal living and dining room, generous eat-in kitchen with laundry station and counter space. Easy access to private rear court yard. Access to huge rear garage from rear court yard. Unable to park a car in this space due to angle of alley. Garage has access to rear alley. This house is loaded with windows which alleys pleasant flow of light throughout the home on both levels. Wood floors throughout & no carpeting. Exposed brick walls, three bedrooms and one bath on second level. Fully unfinished lower level ideal for storage. Forced hot air heating system without central air. Three A/C units in basement convey with the sale. Home inspections are certainly welcome for informational purposes only. Seller will not make any repairs. No known defects. This house shows beautifully. Ideal property for Hopkins or MICA Affiliate. Convenient walk friendly location. This is one not to miss.